Philippe Donche-Gay, BV: We feel uncomfortable when we see class societies claiming to create a new design and then approve the same design wearing another hat. I think it is essential for class societies to maintain our inde- pendent and third party status in this regard. At the same time, however, for ourselves at ClassNK we believe that the very pur- pose of classifi cation is to contribute to the development of the maritime industry, including not only ocean-going vessels, but also inland and coastal shipping, as well as the offshore sector. That is the basis for all of our work and development as an orga- nization. Whether it be developing new services for shipyards or owners, improving our service and quality, or conducting R&D, everything we do is dedicated to protecting life and property at sea, protecting the marine environment and supporting the maritime industry, and I expect that to continue in the future. 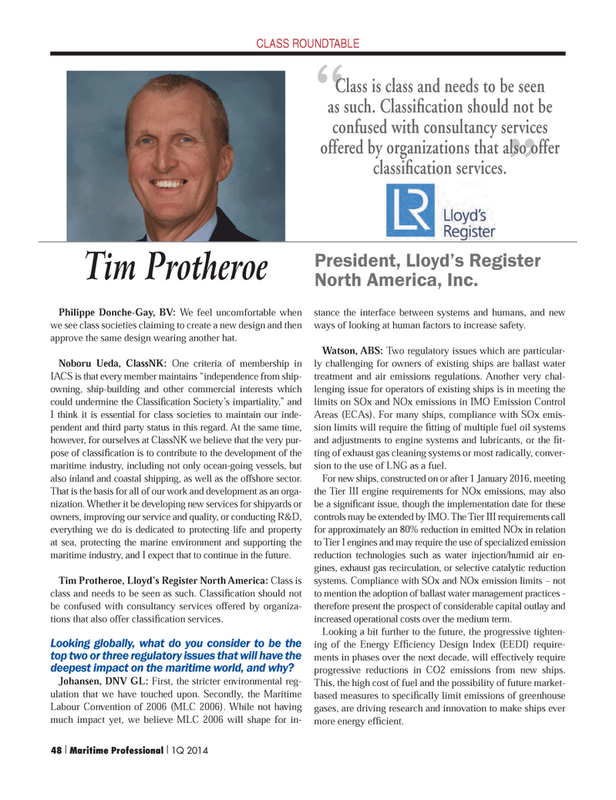 Tim Protheroe, Lloyd’s Register North America: Class is class and needs to be seen as such. Classifi cation should not be confused with consultancy services offered by organiza- tions that also offer classifi cation services. Looking globally, what do you consider to be the top two or three regulatory issues that will have the deepest impact on the maritime world, and why? Labour Convention of 2006 (MLC 2006). While not having much impact yet, we believe MLC 2006 will shape for in- stance the interface between systems and humans, and new ways of looking at human factors to increase safety. Areas (ECAs). For many ships, compliance with SOx emis- sion limits will require the fi tting of multiple fuel oil systems and adjustments to engine systems and lubricants, or the fi t- ting of exhaust gas cleaning systems or most radically, conver- sion to the use of LNG as a fuel. For new ships, constructed on or after 1 January 2016, meeting the Tier III engine requirements for NOx emissions, may also be a signifi cant issue, though the implementation date for these controls may be extended by IMO. The Tier III requirements call for approximately an 80% reduction in emitted NOx in relation to Tier I engines and may require the use of specialized emission reduction technologies such as water injection/humid air en- gines, exhaust gas recirculation, or selective catalytic reduction systems. Compliance with SOx and NOx emission limits – not to mention the adoption of ballast water management practices - therefore present the prospect of considerable capital outlay and increased operational costs over the medium term. Looking a bit further to the future, the progressive tighten- ing of the Energy Effi ciency Design Index (EEDI) require- ments in phases over the next decade, will effectively require progressive reductions in CO2 emissions from new ships. This, the high cost of fuel and the possibility of future market- based measures to specifi cally limit emissions of greenhouse gases, are driving research and innovation to make ships ever more energy effi cient. Class is class and needs to be seen as such. Classifi cation should not be confused with consultancy services offered by organizations that also offer classifi cation services.